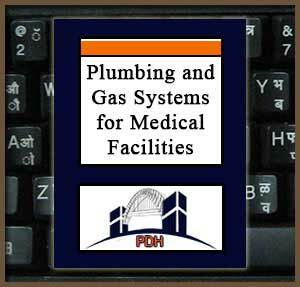 This course will introduce you to the basics of designing plumbing and gas systems for medical treatment facilities such as hospitals, medical and dental offices, and clinical and research medical and dental laboratories. You will learn about plumbing systems including cold and hot water; sanitary, storm and industrial (acid) drainage systems. You will learn fundamentals of medical gas systems including medical and dental compressed air, surgical handpiece drive air, medical-surgical vacuum, high and low dental vacuum, dental dust evacuation, waste anesthesia gas disposal, oxygen, nitrous oxide, sterilization and process (fuel) gas. This course will give engineers and others an introduction to plumbing systems for medical and dental treatment facilities and laboratories, as well as piping systems for various medical gasses. It will give design professionals the foundation they will need to address design issues for a variety of clinical, laboratory and research facilities.